Kurt Russell's Disney movies feature prominently in his acting resumé, but they're no longer what he's primarily noted for. Once he starred as Elvis Presley in a made-for-TV movie, his career took a more serious turn. Had it not been for his time as one of Disney's biggest stars, he might never have even gained the notoriety to land the Elvis gig, let alone this other films, such as his role in Silkwood. A child actor since his guest starring roles on the series Sugarfoot, Kurt Russell moved on to an uncredited role in Elvis Presley's It Happened at the World's Fair, sixteen years before his Emmy-nominated turn as Elvis. After a number of other TV and film roles, Russell began his film career with Disney in 1966 with Follow Me, Boys!, then was awarded a ten-year contract with Walt Disney. The following are his Disney movies before, during, and after that contract. Follow Me, Boys! (1966) - Other than being Russell's first Disney movie, this film is also notable as the last film released before Walt Disney died. Russell starred as Whitey, a young thief who gets adopted by a traveling musician (Fred MacMurray). The older man settles down and becomes a Boy Scout leader and under his guidance, Whitey grows up to become a soldier and doctor. The One and Only, Genuine, Original Family Band (1968) - Russell plays Sidney Bower, part of the musically-talented Bower family who petition the Democratic National Committee to sing a rally song for President Grover Cleveland at the 1888 convention. Instead the family moves to the Republican-dominated Dakota Territory before it's admitted into the union as two states. This movie is also the first to co-star Russell and his future partner, Goldie Hawn. The Horse in the Gray Flannel Suit (1968) - Russell is underused here as Ronnie Gardner, a spoiled rich girl's suitor. The rich girl wants a horse, but it's a little out of Fredrick Bolton, her advertising executive dad's, price range. Fred gets the horse for her anyway and names it after a stomach pill, Aspercel, to make his daughter happy and promote his client's new product at the same time. The Computer Wore Tennis Shoes (1969) - Russell plays college student Dexter Riley, who joins with other students to persuade a businessman to donate an old computer to their school. While trying to fix it during a thunderstorm, Riley gets zapped and becomes a human computer. The Barefoot Executive (1971) - Russell portrays Steven Post, a mailroom clerk, who realizes his girlfriend's pet chimp can predict which television shows will succeed and which will fail. In front of network executives, Post pretends that it's him and not the chimp who is doing the prognosticating. One of Russell's costars was a young John Ritter, who was making his film debut. Now You See Him, Now You Don't (1972) - The sequel to The Computer Wore Tennis Shoes has Riley create a spray that makes people invisible. A group of thieves want to steal the formula to commit a bank robbery. Charley and the Angel (1973) - Reuniting with Fred MacMurray, Russell plays Ray Ferris, a young man eloping with the Charley's daughter. Charley (MacMurray) is a hardware store owner during the Great Depression. Charley doesn't get along well with his family, and an angel visits to tell him he doesn't have long to live, so needs to get his affairs in order. Superdad (1973) - Russell again plays the boyfriend in this film. Bob Crane plays the father of a young woman (Barbara Rush) headed off to college. He wants to separate her from her bad crowd and boyfriend (Russell), so he gets her a scholarship to a different school. The Strongest Man in the World (1975) - In yet another sequel to The Computer Wore Tennis Shoes, Riley gets his chemical experiment mixed with another student's vitamin cereal. They dump the results out and give it to the neighbor's cow, who then gets super strength, prompting the two students to try it on themselves. The Fox and the Hound (1981) - In this animated film, Russell voices the adult version of the character Copper, a hound dog who has become friends with Tod, a red fox voiced by Mickey Rooney. Miracle (2004) - Russell makes his return to live action Disney movies in this true story. He stars as hockey coach Herb Brooks who leads the United States Olympic Mens Team to the gold medal in the 1980 Winter Olympics. Sky High (2005) - In this film that revolved around a superhero family, Russell proves he isn't the young star he once was for Disney. Instead of playing a student or boyfriend, Russell plays a parent, along with Kelly Preston. They pose as real estate agents, but are really powerful superheroes. Kurt Russell's career was made on the Disney stage, and he's gone on to find much more success after his contract ended. If Walt Disney hadn't passed away just when Russell was starting his run with the film company, perhaps things would have turned out differently. 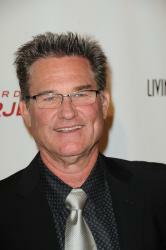 Russell himself has claimed that the last two words Disney wrote before he died in 1966 were "Kurt Russell." He apparently had even bigger plans for him than the decade-long contract.